I have an Orion Tritech II fluid head, and I really really don't like the Mak on it. My 80mm achro is fine, but the Mak... Noooo no. Does it stay in position at high power if you let go of everything? Whats the difference between that and a biggish 44m ball head (used sideways) ? 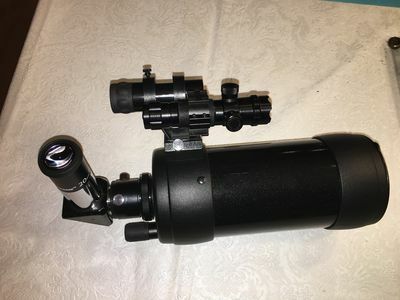 Here is my new grab ‘n go setup, a C90 on a NexStar mount...a one trip package....maybe first light tonight. Mine usually rides on an SLT mount and it works great! I use my C90 on an Orion Eq1 with R.A. clock drive and it works great! I just ordered a zoom EP for mine. I really never cared for the idea of a zoom, but for the portability of the c90 I think it makes sense. 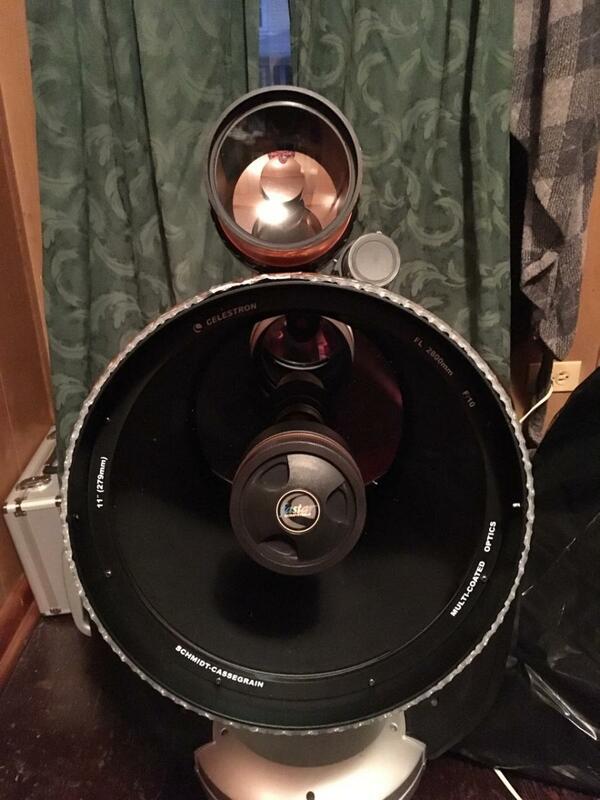 The Celestron Zoom really does match the C90 very well. Dave - is that the Nextstar 4/5 mount? The C90 looks big (but well-mounted!) on it! And I 2nd the zoom lens - I use mine with both the C90 and ST80 (at least for moon/planets) - covers most of the mags I would need on a given night. 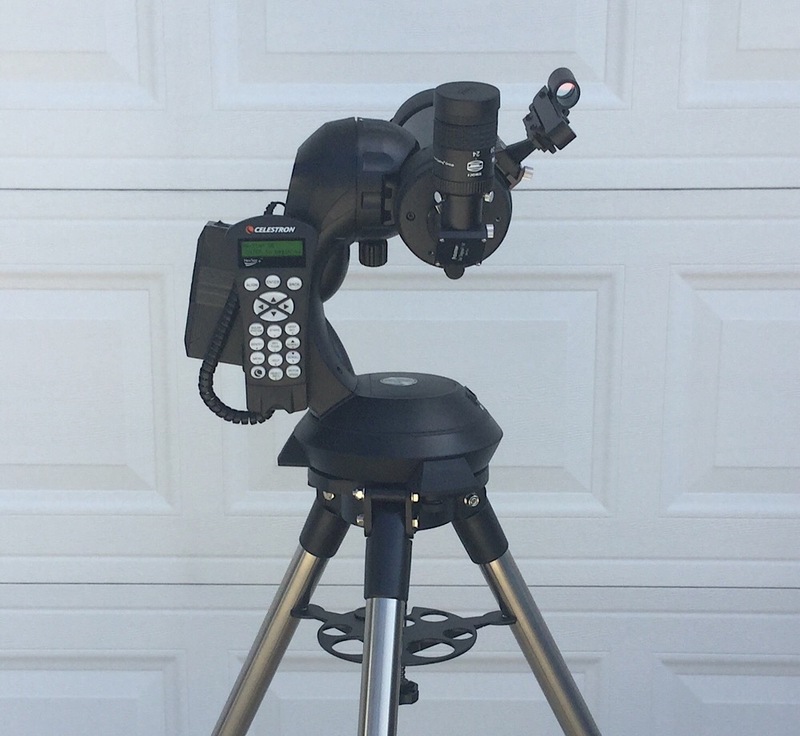 Yes, it is a NexStar 4/5SE mount holding that massive C90. You need something solid like that for one of these monsters . The zoom is a great addition, like you said, covers most mags you would use on the planets, so easy! Finally cleared up in Carolina, with better than average seeing. Let the C90 acclimate for a bit, then walked it to the end of my street to clear the trees. Beautiful crescent moon along side Venus. Even with the moon really low and some tube currents, the terminator looked great. Watched the moon sink below the pines in the 32mm EP. A nice half Venus, followed by some time on Jupiter and Saturn. Turned the scope to Mars, blazing in the southeast. The C90 didn’t disappoint- in a 6mm EP the south polar cap and Syrtus Major were obvious - with Hellas well defined to the south. Mars danced around some, but the seeing held, and the albedo features were clear. 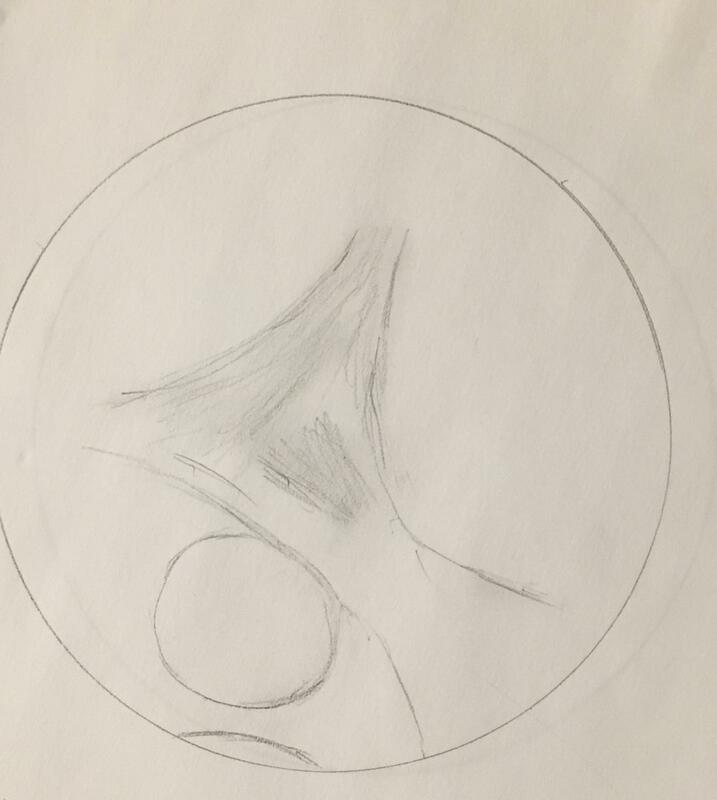 I attempted a sketch - I’m definitely no artist, but you can clearly see what I saw - I didn’t confirm what I was seeing until after; so I’m fairly impressed with the detail that was visible. Hurray for the C90 and the abating dust storm! I received my Celestron Zoom EP today, along with clouds. Nice looking thing and a real nice case. The great thing about this scope, for me, in a nutshell: went out this evening, started out clear, soon followed by high clouds moving in and out fairly quickly. Lots of lightning off to the north. Had to move up and down my street dodging clouds and trees. Saturn looked amazing at 8mm (156x) - nice banding and Cassini visible all the way around. I think I could probably tweak the collimation a little more, but it’s pretty close, given the view I’m getting. When clouds covered Saturn, I turned to Mars. SPC with some limb brightening (blue-white) clear; albedo features in and out in the Southern Hemisphere (Terra Sirenum?). Enjoyed the view for a few minutes until the clouds covered the planet and the lightning seemed to be getting closer. 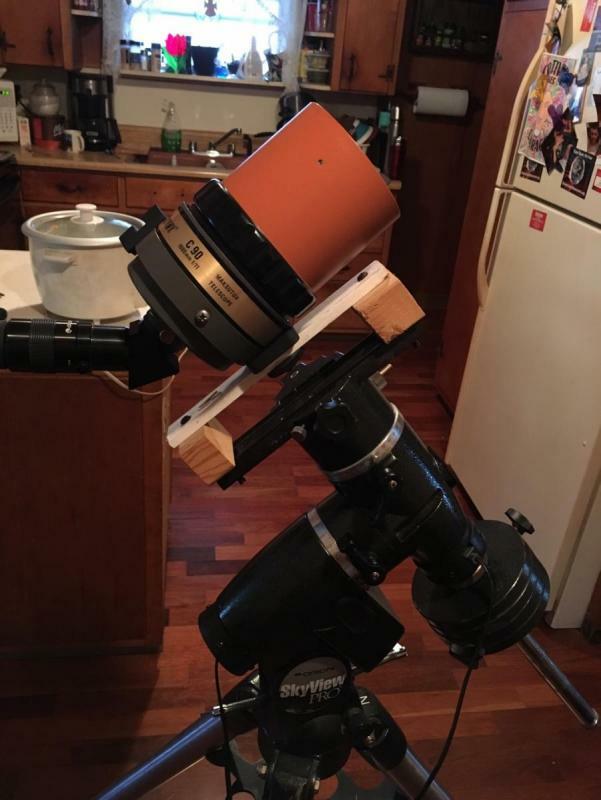 My realization - with the horrible weather this summer, if it weren’t for the C90, I wouldn’t have seen much of Mars at all - not worth even setting up my *big* scope, a C6. That alone makes it worth the price of admission. I had just as good of a view of Mars last weekend in the C90 as in my 127 mak and c6. All of which are collimated. Seeing was not the best, maybe that had something to do with it. 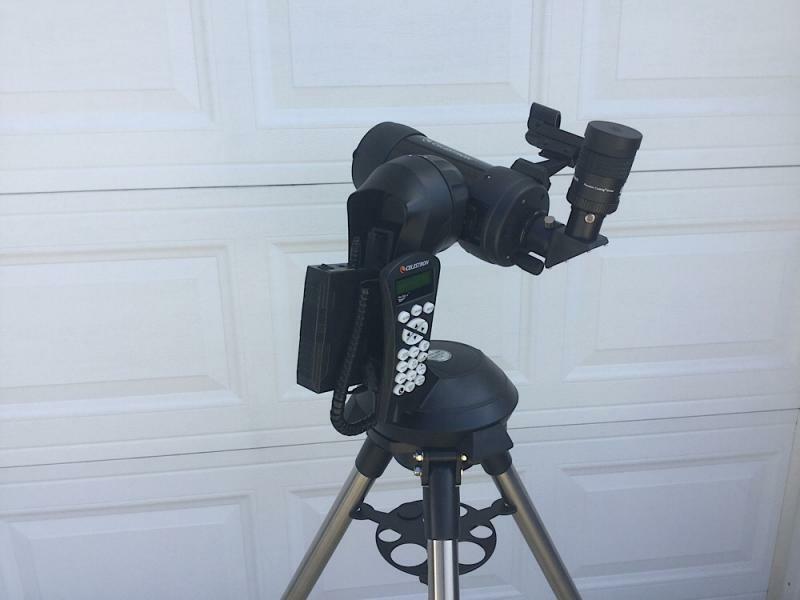 This little scope is a true gem, I bought it as a little gimmick and for Lunar work, but it always surprises me. Edited by PXR-5, 31 August 2018 - 10:57 PM. The C90 came out during an evening troop meeting this past Monday. The boys enjoyed views of Jupiter, Mars, and Saturn. 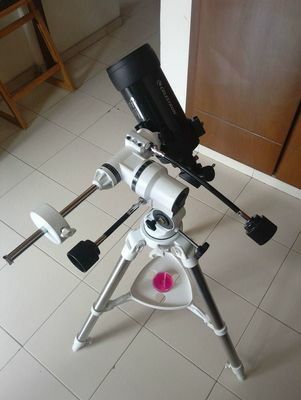 The parents were surprised at what can be seen with it, as well as its price since it isn’t a “department store telescope”. Hopefully, we have a few more converts. I have been using mine a bit also, this is C90 #2, looking back at my notes when I had the first one, I used a TV 11mm Plossl and a x2 Barlow one night for a magnification just over x220, the current one I have seems to run out of steam at about x180 but the moon is lower to the horizon, light pollution has increased a lot so it may just be a case of not getting a night of really good conditions? ,D.
I had just as good of a view of Mars last weekend in the C90 as in my 127 mak and c6. This happened to me a several weeks ago as well, I observed Mars with the C90 and took notice of how the view was essentially as good as I was getting with my C6. While Jupiter is a different story, and Saturn is somewhere in between, still as Jupiter is now lower, more and more of the recent nights I've been observing with just the C90, while the C6 (and the 10" dob) relax. I just got an orange tube C90 spotter. I wanted it for a g&g/travel scope. I haven’t had a chance to try it yet, but I’m looking forward to testing it out against the AT102ed, and a Lumicon 80mm Super Finder. Apples to oranges I know, but it will still be fun. And it looks so cute compared to the C11! This thread just keeps going and going..... (kinda like the C90). Just thought I'd add another report. 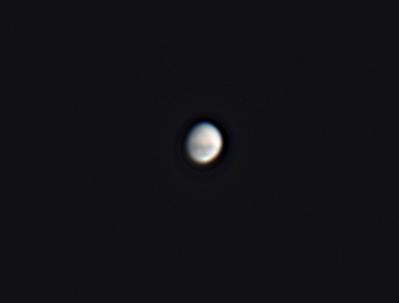 I brought mine out last night for a quick look Venus, then decided to stick around and give it a go at imaging Mars and Saturn (haven't processed the data yet, but visually Saturn looked great, Mars less so but polar cap and hazy details were there visually at around 125x). I left it outside and returned later for what I figured would be a quick half hour or hour long session. I ended up spending 3 hours exploring various double stars in Aquarius, Pegasus and Cepheus, most of which were "first time observing" for me. I was using the Sky Watcher Light Chariot (SW's version of Celstron's SLT mount) which works very well with the little C90, highly portable since I usually run it off of the 8 AA battery pouch that hangs from the mount. The whole thing can be carried with one hand (including scope). Tight doubles of nearly equal magnitude are especially pleasing, since the diffraction arcs that appear around the stars at around 125X (2x barlow of a 20mm Sterling plossl) just add to the asthetics...made it seem like to eyes peering back at me from deep space (29 Aqr). Edited by caheaton, 30 September 2018 - 11:23 PM. Still working on the data, but here's a quick initial process using registax & gimp from the laptop. Mars turned out better than I expected, considering how it was looking naked eye. Image was taken through the C90 using the Starshoot 5MP without a barlow. Just had a chance to look at this photo from the desktop (I'd processed it from the laptop). Looks like I blew out the highlights a touch, will have to adjust that....the laptop has a dimmer screen so I missed that initially. Edited by caheaton, 01 October 2018 - 10:56 PM. Some time ago I checked the focal length of my C90 and found it to be 1450mm as opposed to 1250mm (and my 127mak is 1750mm and not 1540mm). Just some food for thought when choosing an eyepiece. Under my typical seeing condition I find my TV11mm plossl gives the best views (132x). If the seeing is good I will take out my TV 8mm (180x) but that's about the max I will go. Edited by Eric63, 01 October 2018 - 09:21 PM. Mounting the Pinty laser pointer on my C90. The double ring mount comes with the pointer. It fits perfectly around the finder. I didn't want to file the rings but I could have done so to place the pointer mount between them. Almost looks like it is made for it.